There's nothing more decadent than a little Nutella swirled into your banana bread. Or Nutella swirled into anything for that matter. I just love that stuff. 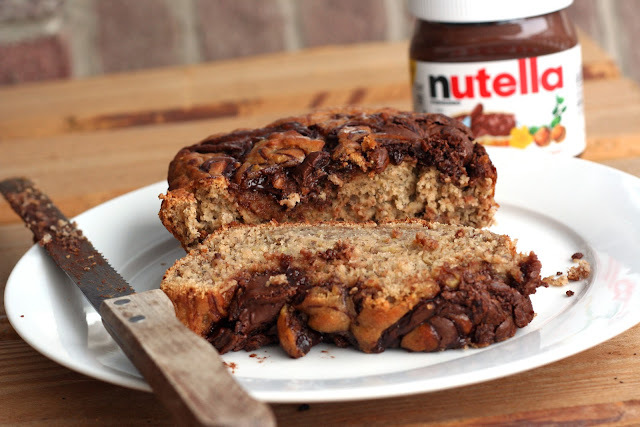 Oh and bananas and Nutella? Totally meant to be together. 1. Preheat oven to 350F. Spray a 9×5-inch loaf pan with cooking spray. Set aside. 2. In a medium bowl, whisk together the flour, baking soda, salt, and cinnamon. Set aside. In a separate large bowl, beat the brown sugar and butter with a stand or handheld mixer on medium speed until well blended – about 1 minute. Add the eggs one at a time, beating well after each addition. With a wooden spoon, stir in the mashed banana, yogurt, and vanilla. Slowly add in the dry ingredients. Do NOT overmix. Batter will be thick. 4. Bake for 40-45 minutes or until a wooden pick inserted in center comes out clean. Cool 15 minutes in the pan on a wire rack. Remove from pan and cool completely on the wire rack.